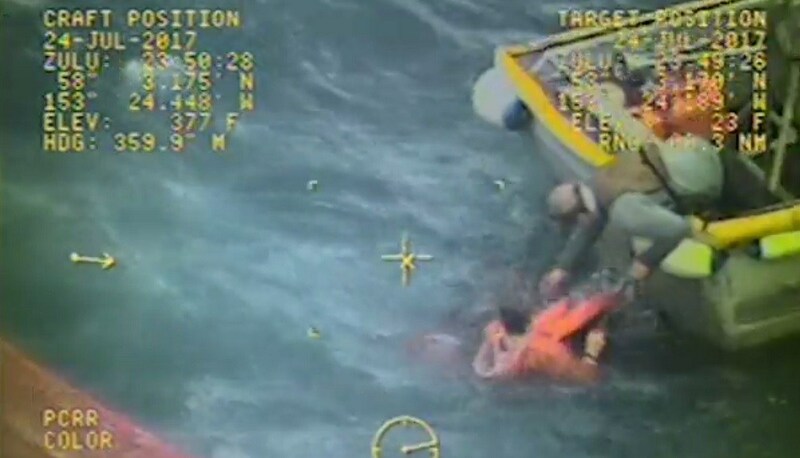 A Good Samaritan vessel and a Coast Guard aircrew rescued four fishermen in Kodiak waters on Monday. According to a Coast Guard press release, the fishing vessel Grayling capsized in Kuprean of Strait near Raspberry Island, and the nearby Calista Marie came to their aid. An Air Station Kodiak MH-60 Jayhawk helicopter on a training flight also responded. Pilot Lt. Kevin Riley said they were flying in the vicinity of Old Harbor when they got word from Air Station Kodiak about the vessel’s distress call. Riley said it took the helicopter crew about 20 minutes to travel the 55 miles to the location. “So, we had just made one pass, maybe two, searching overheard of the seiner that was upside down now and we could see the net through the water when we saw visually and in our sensor the crew member that was missing, basically floating,” Riley said. Riley said when he brought the Jayhawk down into a hover, he saw the Grayling’s captain plunge into the water to rescue the crewman. According to the press release, the captain successfully performed CPR on the crewman and they met up with the Coast Guard on the closest beach. Riley said usually radio communication is vital when working with partners on a rescue. In this case, the Good Samaritan responders were too busy during the rescue to talk. Riley said he’s grateful for the help from the Good Samaritan vessel and others on scene. “You know, it’s part of our job where we’re usually seeing people on some of the worst days of their lives, but it’s really encouraging and heartening to see the best in people come out,” Riley said. Once on the beach, the Jayhawk helicopter team flew the crewman to emergency services at the Kodiak Municipal Airport. According to the press release, weather at the time was 17-mph winds and 5-foot seas, with high visibility.